Best of all terminator movies! Sam worthington did terrific as Marcus Wright! 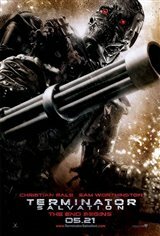 The best terminator movie among all! I really enjoy all things Terminator so I went into the movie expecting entertaining terminator fun and I found it! The story was not what I was looking for in #4 but it was fun. Lots of action and the cheesy lines made me smile. Really, not the greatest movie. Save your money and try something different. Who can follow the time line through out all of the terminators.First hes sent back from the future then in the future blah blah blah.They shoud have named this movie something else doesnt deserve the "Terminator" title. And what was with the crappy "CG" arnie he looked like craP.